To satisfy my craving, I made a thick oatmeal bowl resembling a custard. Since berries aren't too sweet, they added just the right amount of tangy sweetness, so I wasn't left feeling any more sugar-stuffed than I already was. I felt like I had breakfast, not dessert, and it was a good change of pace! In a blender or magic bullet, take a few strawberries and blend them until pureed (I used about 3 large ones, but go ahead and use more or less depending how "strawberryish" you want your oat custard to taste). In a saucepan, pour in 1/4 cup almond milk and 1/2 cup water, cover, and bring to a boil on medium heat. Meanwhile, in a separate bowl, whisk together the egg, egg whites, 2 tbsp. almond milk, strawberry puree, an ample amount of cinnamon, and vanilla until thoroughly mixed together in. Once the almond milk and water comes to a boil, slowly pour the liquid into the egg mixture, stirring as you pour - this tempers the egg, or allows the egg to combine with the heated liquids without turning into scrambled eggs! Once all the liquids and eggs are combined and stirred together, pour it back into the saucepan, add the old-fashioned rolled oats, and reduce heat to medium-low. Continuously stir the oats for about 4 minutes. During this time, the liquid combined with the oats will slowly thicken to a custard-like consistency. For the last minute, you can just allow the oats to simmer; it will slightly bubble and "pop" during this time, and you can stir occasionally. Remove the oats from the heat once they reach your desired thickness. 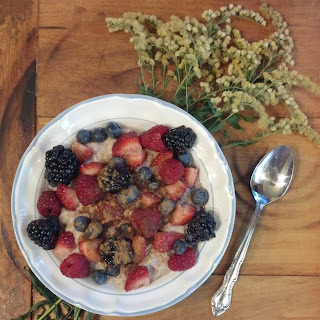 Top the oat bowl with the fresh berries and more cinnamon. Maple Nut Oatmeal...Just Like the Ice Cream!